You can blame my love of Justin Timberlake songs for this post’s title, and my hairdresser Jaclyn for its inspiration. Over the past year and a half I’ve enjoyed reliving my wedding planning days through Jaclyn as she planned her wedding to her fiance Larry. I’d spend my time in the hair chair excitedly asking her about her dress, flowers, invitations, bridesmaids, wedding music–everything! It wasn’t until just before her wedding that I realized I’d yet to ask what her new married last name would be! I’d been trying to think of a little something I could give her for a wedding gift, and with that reply I knew exactly what my gift would be. 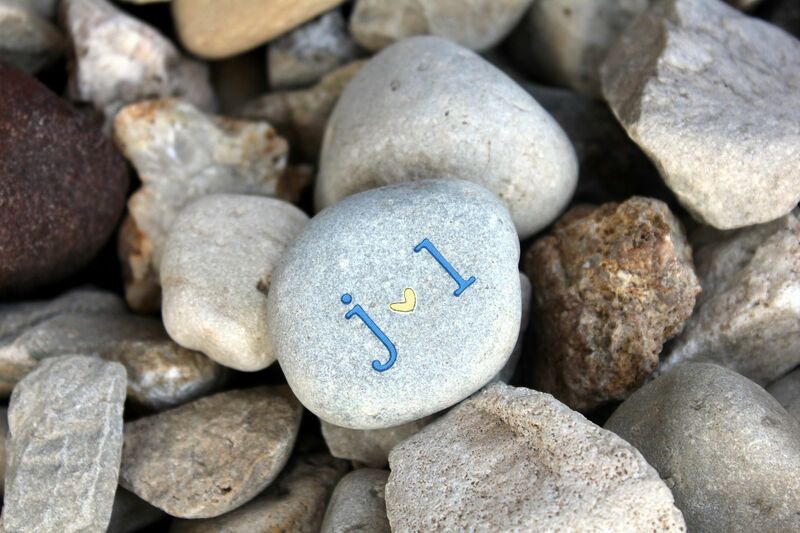 I went home, found the perfect little stone in our landscape bed and used rub-on transfer letters to add a “J” and an “L” with a little heart in between. Stone in Love! Isn’t that some sort of 80s awesomeness too? I like that gift. You are super thoughtful. Such a creative idea – love it! What are you on and where can I get some…seriously. And don’t tell me it’s the wine. Wine puts me to sleep. BTW, the ellipses is my dash. Found you searching for an old pic from Wonderful Graffiti. Maybe you’re familiar? It was a custom job on an entryway mirror with all different words/phrases you’d hear at the front door…? Worth asking. Anyway, your home is nauseatingly beautiful. Really. I’m on the verge of lighting a match here and starting from scratch. How do you keep your daughter from dismantling that lovely picture wall in your dining rm? (Mine are 4 and 14 mos.) Good luck to you! I love this idea and it is so simple, it almost looks engraved. It’s awesome. @Katie–Those forks are fantastic! What a wonderful gift idea! @Anonymous–You are too funny. I am definitely the most inspired when I’ve got a glass or five of Chardonnay in me. That’s too bad it puts you to sleep! Have you tried large doses of SportsCenter? That’s what puts me to sleep, so maybe it would have the opposite effect on you. Just a thought. The photo wall in the dining room is pretty much the only thing in our entire house that Kate’s not allowed to touch. I decided to keep it up to teach her what “no touch” means and that once in a while there are things that are off limits. She does great with it, but she’s also a pretty mild-manner chic so I’m sure that helps. I tried searching for the entryway mirror idea you described but didn’t have any luck. I even asked my slore of design whores and it didn’t ring any bells for them, unfortunately. Good luck in your continued search!